[226 Pages Report] The overall carbon black market is expected to grow from USD 11.02 billion in 2016 to USD 2.30 billion by 2021, at a CAGR of 4.6% from 2016 to 2021. Carbon black offer several advantages, such as increasing tires tread wear and rolling resistance; absorb UV light and convert it to heat, thereby, making plastics more resistant to UV radiation; and impart pigmentation, UV protection, and thermal conductivity to coatings, which, in turn, help in the growth of the market. The carbon black market is expanding with the emergence of new applications and technologies. Carbon black is being used in many applications such as tires, non-tire rubbers, plastics, inks & coatings, lithium-ion batteries, graphite manufacturing, construction, and metallurgy. The base year considered for the study is 2015, and the forecast has been provided for the period between 2016 and 2021. Carbon black is used in tire and non-tire rubber products as a reinforcing agent and shock absorbent. It is added in different parts of tires such as inner-liners, carcasses, sidewalls, and treads and rubber products such as air springs, belts, hoses, gaskets, bushings, wiper blades, and diaphragm. Carbon black improves lifespan of tires as it conducts heat away from the tread and belt area of tires. In addition, it also imparts color to tire and rubber products. 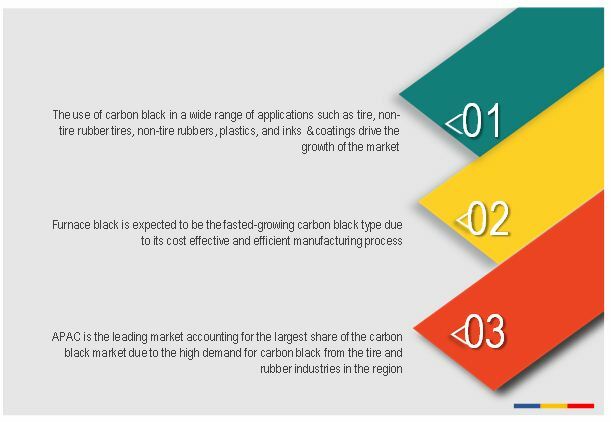 Therefore, the growing tire and rubber industries drive the growth of the carbon black market. During this research study, major players operating in the carbon black market in various regions have been identified, and their offerings, regional presence, and distribution channels have been analyzed through in-depth discussions. Top-down and bottom-up approaches have been used to determine the overall market size. Sizes of the other individual markets have been estimated using the percentage splits obtained through secondary sources such as Hoovers, Bloomberg BusinessWeek, and Factiva, along with primary respondents. The entire procedure includes the study of the annual and financial reports of the top market players and extensive interviews with industry experts such as CEOs, VPs, directors, and marketing executives for key insights (both qualitative and quantitative) pertaining to the market. The figure below shows the breakdown of the primaries on the basis of the company type, designation, and region considered during the research study. 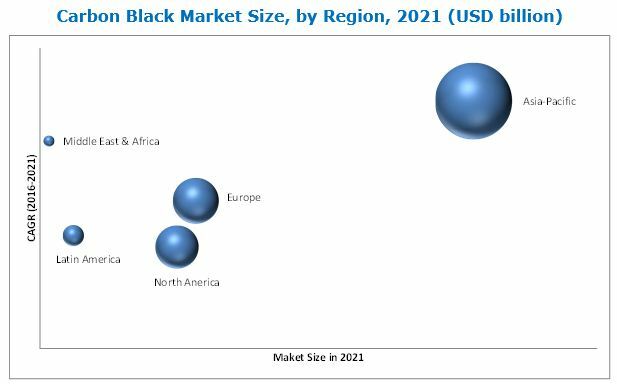 The carbon black market comprises a network of players involved in the research and product development; raw material supply; component manufacturing; distribution and sale; and post-sales services. Key players considered in the analysis of the carbon black market are Cabot Corporation (U.S.), Birla Carbon/Thai Carbon Black Public Company Limited (Thailand), Orion Engineered Carbons SA (Luxembourg), Phillips Carbon Black Limited (India), Tokai Carbon Co., Ltd. (Japan), Omsk Carbon Group OOO (Russia), Jiangxi Black Cat Carbon Black Inc., Ltd. (China), OCI Company Ltd. (South Korea), China Synthetic Rubber Corporation (China), Sid Richardson Carbon & Energy Co. (U.S.), and Mitsubishi Chemical Corporation (Japan). In November 2016, Phillips Carbon Black Limited has a current manufacturing capacity of 4.72 million tons per year. The company is planning to expand its capacity by 8% at the Palej and Mundra plants in Gujarat, through brownfield expansion. In October 2016, Cabot announced its plans to invest in its Belgium facility to increase capacity for plastic formulations for conductive compounds and masterbatches for engineering thermoplastic applications. In October 2016, Orion developed a product line by converting their tire-grade carbon black line to specialty and technical grades. This conversion or development will impact the long-term planning of the company to transit their product portfolio for specialty and technically grades of rubber applications. What are new application areas which the carbon black manufacturing companies are exploring? Carbon black is a form of paracrystalline carbon manufactured by processing hydrocarbon feedstocks such as fluid catalytic cracking (FCC) tar, coal tar, ethylene cracking tar, and vegetable oil. It is either produced through incomplete combustion of these products or thermal decomposition of gaseous or liquid hydrocarbons. Carbon black market has been segmented, on the basis of its manufacturing process, into different types. These types are furnace black, thermal black, channel black, and acetylene black. The market for furnace black is expected to grow at the highest CAGR between 2016 and 2021. Among all the types, furnace black is the most widely used carbon black as its manufacturing process enables mass production with different particle sizes and structures. Furthermore, furnace black can be used for various applications such as rubber reinforcement and coloring. 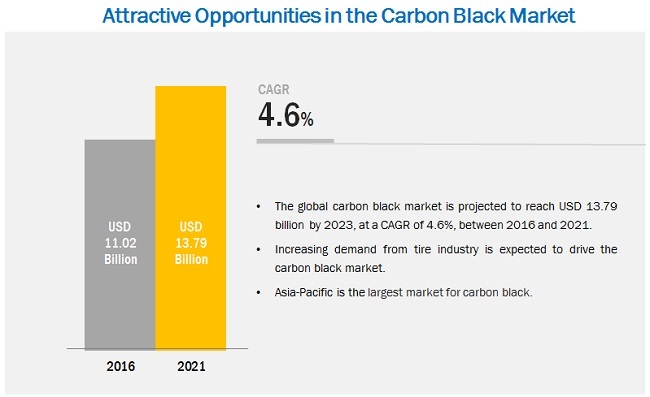 The carbon black market in APAC is expected to grow at the highest CAGR during the forecast period. The growing end-use industries such as automobile, tire, rubber, plastic, ink & coating, and paint has led to the increase in the demand for carbon black in this region. Several North American and European manufacturers are shifting their manufacturing plants to Asia-Pacific due to the low-cost manufacturing advantage in the region. As a result, APAC holds a significant share of the overall carbon black market. The tire is one of those applications where carbon black is extensively used for various purposes. Carbon black is used in different parts of tires such as inner-liners, carcasses, sidewalls, and treads, depending on the specific performance requirements. It improves the lifespan of tires as it conducts heat away from the tread and belt area of tires. In addition, carbon black also imparts color to tires. Carbon black is used as a reinforcing agent and shock absorbent in non-tire rubber products. It is used in the manufacturing of wide range of rubber products such as air springs, belts, hoses, vibration isolation devices, gaskets, bushings, chassis bumpers, pads, wiper blades, grommets, and diaphragm. In addition, carbon black is added in footwear rubber for abrasion resistance and in commercial roofing and weather stripping products for improving resistance. Carbon black plays an important role in plastics application. It is used as filler in the manufacturing of a variety of plastic products such as pipes, films, stretch wrap, industrial bags, photographic containers, and semi-conductive cable compounds. It provides strength, thermal conductivity, antistatic properties and UV protection to plastic products, thereby, improving the performance of plastic products. In inks & coatings application, carbon black is used to impart pigmentation, UV protection, and thermal conductivity to coatings used in aerospace, automotive, marine, decorative wood, and industrial sectors. It is also used as a pigment in inkjets and paints. What are the upcoming industry applications for carbon black? Emission of CO2 gas, nitrogen oxide (NOX), sulfur dioxide (SO2) and particulate matter (PM) during carbon black production is a major factor restraining the growth of the market. The U.S. Environmental Protection Agency (USEPA) has implemented regulations that mandate installing additional technology at all U.S. carbon black manufacturing facilities to reduce emissions of harmful gasses. The International Agency for Research on Cancer (IARC) also raised concern regarding the harmful effects of carbon black on humans. Key players in the market include Phillips Carbon Black Limited (India), Cabot Corporation (U.S.), OCI Company Ltd. (South Korea), Birla Carbon/Thai Carbon Black Public Company Limited (Thailand), Omsk Carbon Group OOO (Russia), Orion Engineered Carbons SA (Luxembourg), and Tokai Carbon Co., Ltd. (Japan). 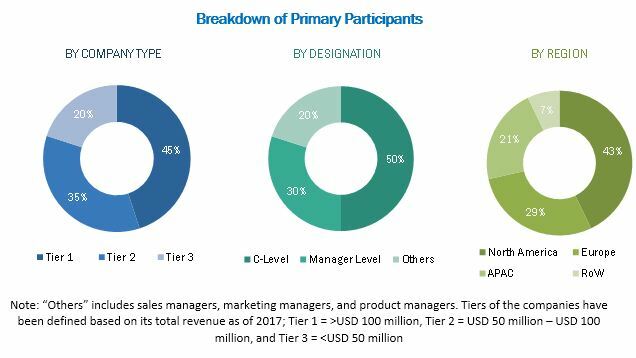 These players are increasingly undertaking expansions, acquisitions, and new product developments to expand their market share and distribution network in the market. 12.3 Orion Engineered Carbons S.A.
12.5 Tokai Carbon Co., Ltd.
12.7 Jiangxi Black Cat Carbon Black Inc., Ltd.
12.10 SID Richardson Carbon & Energy Co.
12.12.2 Longxing Chemical Stock Co, Ltd.
12.12.3 Himadri Chemicals & Industries Ltd.
12.12.4 Shandong Lion King Carbon Black Co., Ltd.
12.12.5 Nippon Steel & Sumikin Chemical Co., Ltd.
12.12.6 Suzhou Baohua Carbon Black Co., Ltd.
12.12.7 Asahi Carbon Co., Ltd.
12.12.8 Shandong Huadong Rubber Materials Co., Ltd.
12.12.9 PJSC "Kremenchug Carbon Black Plant"
Table 82 Carbon Black Imports in the U.S.